First things first. If you don’t wear a flag pin and you’re running for president, you obviously hate America, and want the terrorists to win. 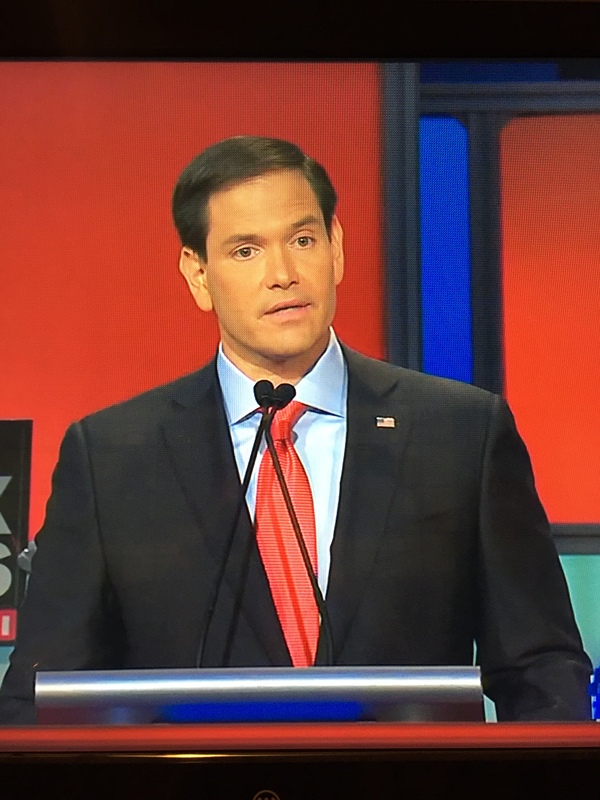 Last night was the Republican national debate. We’re taking a break from pocket squares to talk about it. When the question was asked: How many men in blue suits can you put on a stage? The answer apparently is ten. There was also a debate at 5 with some more crazies candidates. But those were the also-rans. They didn’t make prime time. So they don’t get any column inches here. I really tried not to listen a lot to what most of these guys were saying. Mostly because I value my sanity. I mean, the last question of the night was whether any of the candidates had received “a word from God.” Thankfully, none of them were able to quote what God told them. Point is they were all wearing suits and ties. Though NONE of them, save for the hosts, wore pocket squares. So I wouldn’t vote for any of them on principle before they even open their mouths. But there’s really nothing better than spending a Thursday judging some middle-aged men on what other people told them to wear. Though I don’t think anyone did a great job instructing them on that front. And some of them could just use a quick visit to the tailor. This isn’t the Oscars and these aren’t A-List celebrities, but I’m going to go ahead and pretend that they care about their wardrobe enough to be judged on it anyways. They’re politicians, so they do plenty of judging themselves. Trump looked like Trump. Classic navy blue suit, crisp white as snow shirt, and a red tie that was as red as his blood will run whenever El Chapo gets a hold of him. Being a flashy guy, he wore cufflinks. His trademark hair though, was far less majestic than normal. I was honestly expecting it to be in its full majestic mane, and frankly, I was very disappointed. I wanted his hair to wear a tie. He looked the most presidential of any of the men on stage. His suit fit perfectly, and his hair was as stiff as his unwavering commitment to circa-1950’s political views. At the very least, he’s got the presidential look down. And he didn’t even stop to take a drink of water once when he was talking. 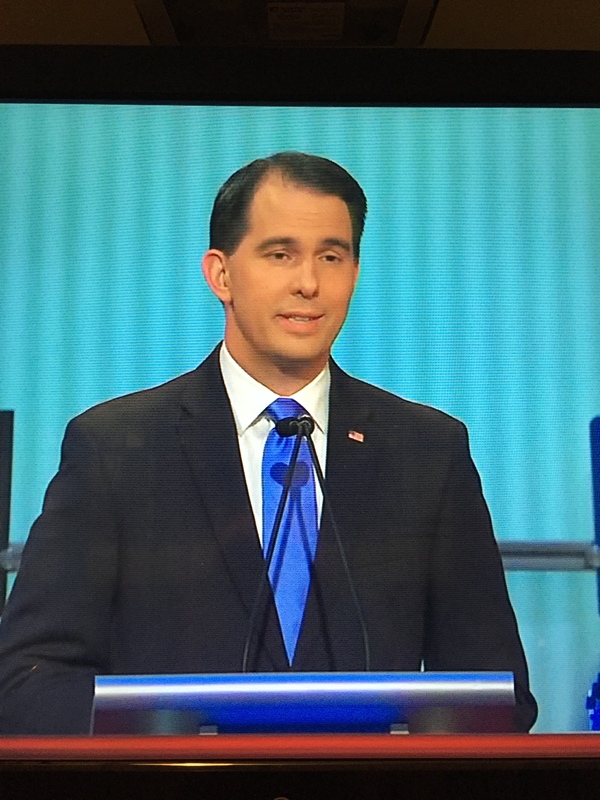 Classic look, and I like the oxford blue and strong red tie. But he had a huge gap between the collar of his shirt and jacket. Which means his suit didn’t fit right. It looks like he went to a tailor, just not a great one. And he frequently gesticulated wildly meaning that it was drawn to attention. Plus, I don’t know what was on his head. A poodle maybe? Honestly, if an 80 year old women went down to the hair salon for a perm, I don’t think she could have that kind of curl and/or volume. Plus, I think she might be more progressive than Paul. 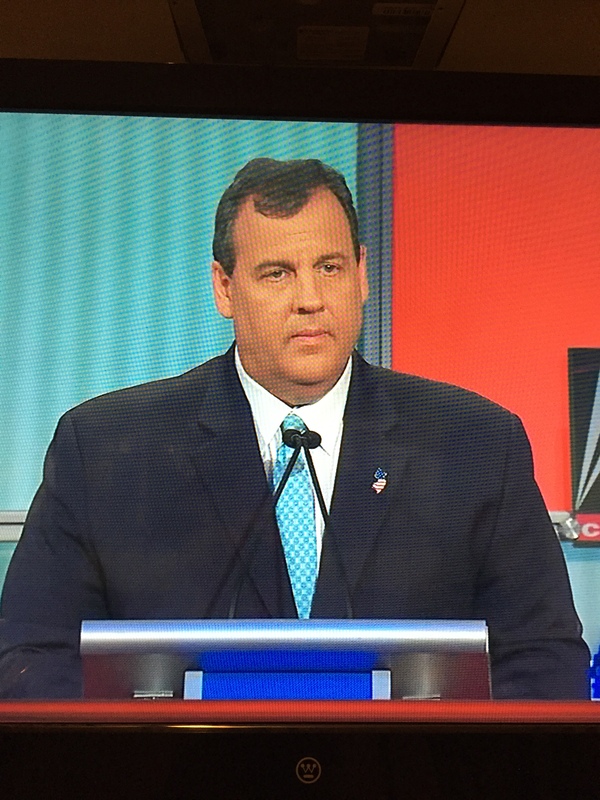 Christie has probably the boldest tie choice of the night. Somehow, the teal blue works. But his flag pin was an american flag overlayed on the state of New Jersey. Being that his state is #1 in landfills and the men who run them, I was kind of expecting a peak lapel double-breasted pin-stripe ensemble. That would have won him the style prize of the debate. Unfortunately, it was not to be. Then again, that’s never really been his thing. Someone needs to do something with his hair. It looks like he took shoe polish to it, and then no one told him that there’s a giant bald spot in the back. His suit fits kind of okay, save for the dimpling on the arms. But his tie was simply off. The knot appeared too small for his collar and size of the tie, and the dimple was way too big. 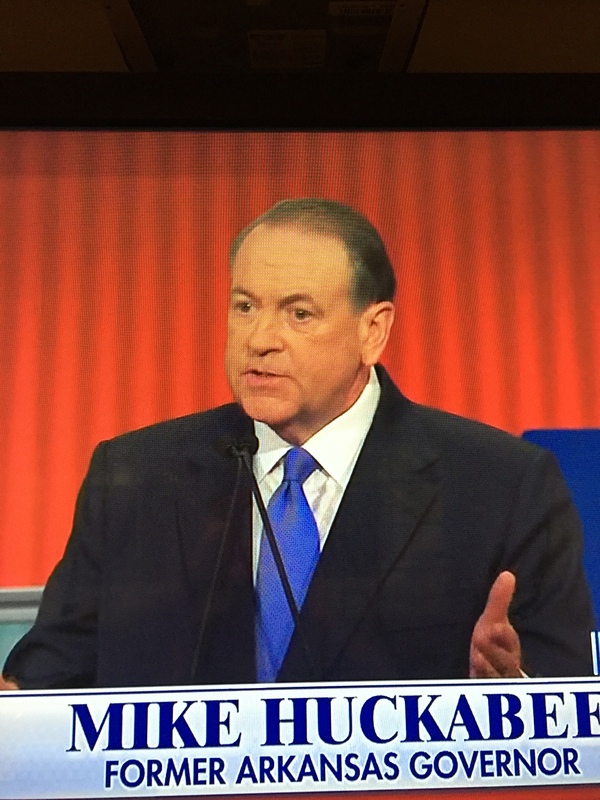 Mike Huckabee didn’t wear a flag pin. This means he hates america. He also wore a blue tie, so he’s weak. And he wore French cuffs, so he’ll surrender. 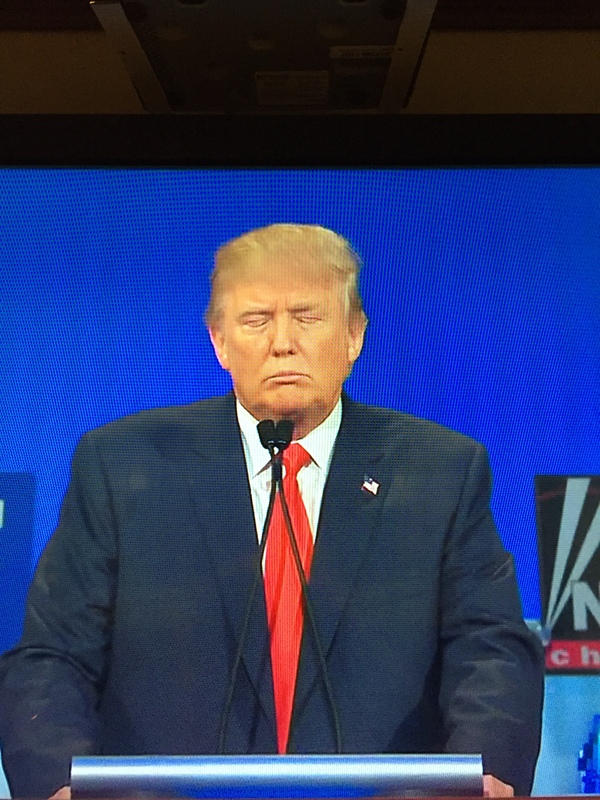 His suit was too large for him, and it made him look kind of bloated. Like the federal government budget that apparently everyone wants to cut after imposing a flat/regressive/consumption tax. 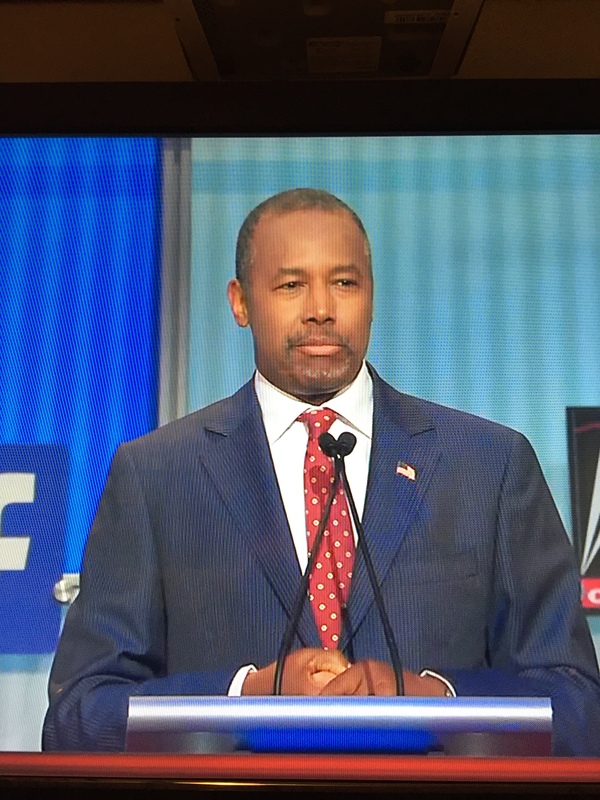 Carson went with the pinstripe suit. But it didn’t hit his shoulders quite right. The pinstripes are a bold choice, but that combined with a thinner tie than nearly any of the other candidates made him just look out of place. He tried, but missed the mark on this one. I appreciate the effort. 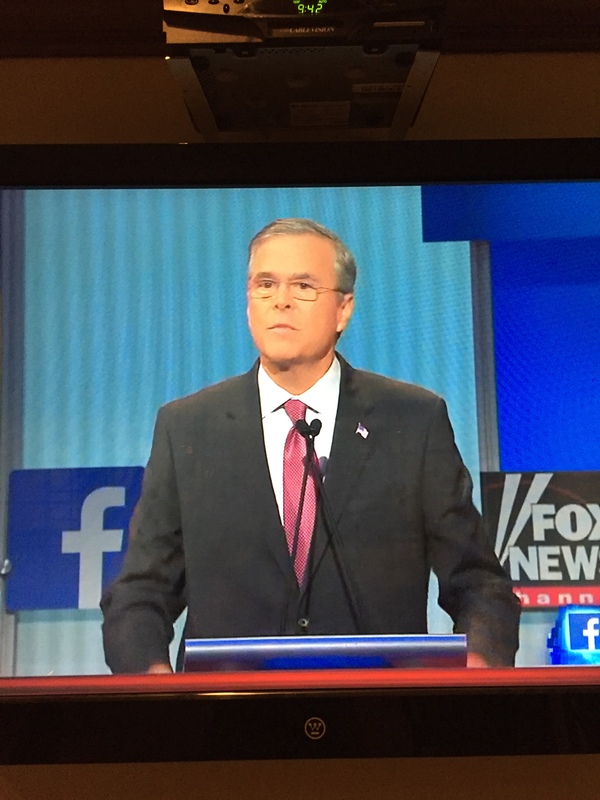 Honestly Jeb was forgettable. In the debate and his wardrobe. If he was going for presidential he missed, and ended up at old business executive. Which, given the amount of money in his war chest, I suppose he is. But presidents are supposed to represent strength and certitude, and he did not. His tie was too understated in maroon to really radiate power. It made him look older and more understated. Which, in a field of ten, was perhaps his intention. To appear reserved and calm in a giant field of wild men. No flag pin for Gov. 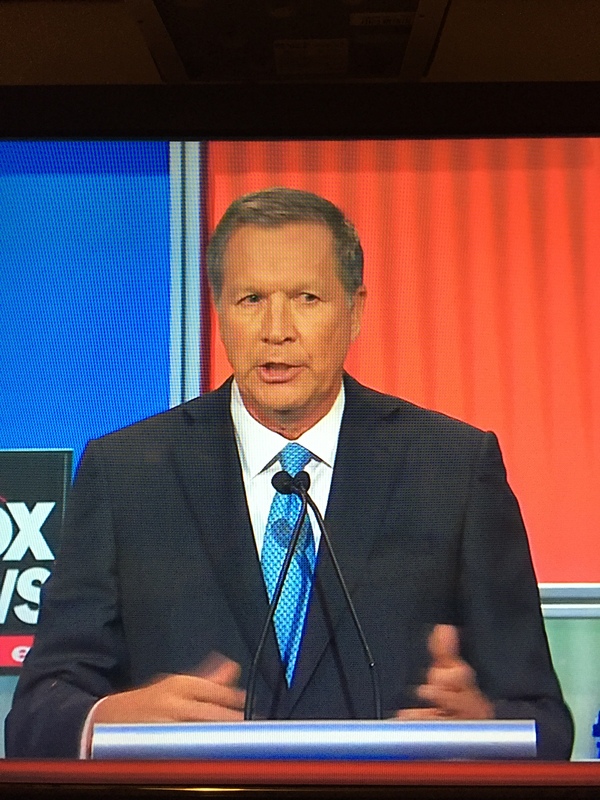 Kasich either. What happened to Republicans loving America, and showing it by wearing a flag pin? I did like his tie, but I always prefer the red look for presidents. 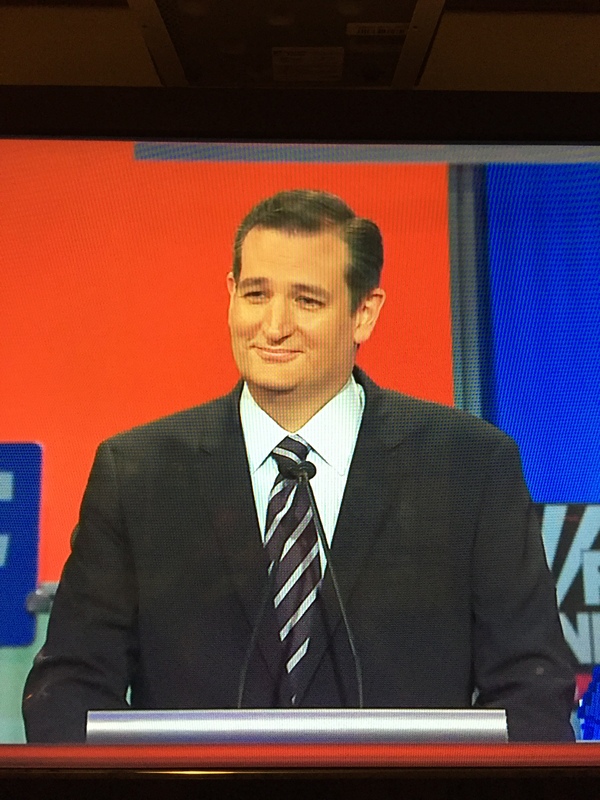 Ted Cruz looked like he was going to a funeral. At least his suit fit. But I’m pretty sure it was black. Like his tie. And soul. For men that have millions and millions of dollars in a war chest to run a campaign, they really all need to hire someone to handle their wardrobe. I would be willing to consult as long as we can promise to not talk politics. Keep an eye out for my coverage of the Democratic Debate, when I will refrain from talking about Hilary Clinton’s pantsuit, and keep my fingers crossed that someone can hold down Bernie Sanders long enough to comb his hair. 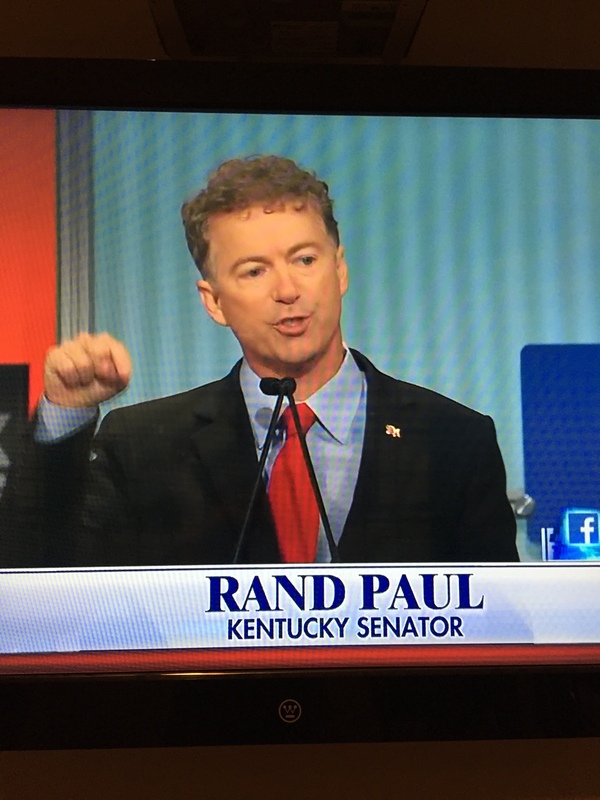 Your Rand Paul commentary slays. If need some perspective on lady pant suits during the dems debate, let me know. Trump drives me nuts by never buttoning his jacket. Looks sloppy.